In my Learning Centers course the author, Ms. Maxine Edwards Cornwell, states that there are some primary centers that all childcare facilities must have. What are they you might ask? The first and most important would be the block center, followed closely by the art center. She then states that other centers that should be given priority are the cooking center, family center, and the quiet center. I thought I might take some time to explore each center with you. As the block center is the most important I thought it a good place to start. So, why is the block center so important? Here is a center that involves the whole child. There is physical attributes because of the actual process of picking up, carrying, and building of the blocks. There is the intellectual aspect because of the thought process going into the creation of the architecture. Then there is the social aspect of conversing with neighbors, working around and with others, and building what they know. Finally, the emotional aspect of creating something unique and beautiful. The block center is an open-ended process. A child can't take the finished product of a block center home, so in that way it frees a child to "experiment, plan, change, negotiate, and enjoy without the pressure of an end product." I thought it interesting, yet should have been a no-brainer, that it is extremely important for the teacher to always let the children feel the job they are doing with the blocks, is just as important as when they are mastering their name writing for example. The block center holds more importance to the children when it is important to the teacher. Kay Stritzel had some great ideas in her article that I would like to institute in my block center. "Blocks are not like painting and other art forms since you can not display them, but there are ways to "save" them: if possible leave the constructions up for a day or so--would not be able to do this in our center; label construction; take photographs to display a block book--liked this idea; take dictation or have children write stories about their work; make sketches of the buildings; collect pictures to display near the art center--something I look forward to doing next year. A block center should have a border. Blocks should be contained on marked shelves. Block centers should include other play materials such as, wheel toys, farm animals, people, etc. Block centers sometimes go outside. The center should not be in the main line of traffic. 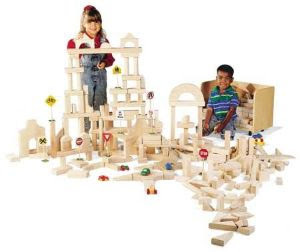 The center should include, unit blocks, hollow blocks, shaped blocks, cube blocks, cardboard blocks, bristle blocks, or any other geometric shape that can be used to construct. Teachers recognize the stages of play. Stage 1--blocks come off the shelf, get spread on the floor, big mess! This helps the child see what's available and become acquainted with the materials. "Big Mess is play." Stage 2--blocks are put in rows. Stage 3--stacking, bridging and full-fledged construction. So how do I measure up? Block center has a border, check; Blocks located on shelves-no check, lots of blocks, lots of containers; Block center contains other materials, check; Block center goes outside--no check--actually never thought about it before, but not an easy task as our center is on the second floor; Not in the main line of traffic--so/so check--not in the middle of the room! ; Different types of blocks, check--don't have all of them, but a large majority; Recognizing stages of play, check NOW that I know. Finally, the author suggest two types of blocks which are very valuable. First you have the unit blocks. 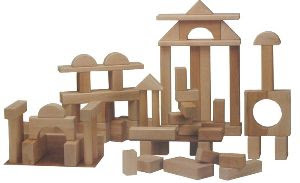 These are blocks that are wooden blocks with different shapes and sizes. Unit blocks are found in most centers. The writer suggest 400 blocks for a total of 8 children playing--I don't think I have that many. The other type of block suggestead by Sally Cartwright is extremely fun for the children and works large motor skills immensely, large blocks--I have none of these. These are "large hollow blocks, boards, packing boxes, often with small ladders and saw horses, designed to fit together for safe building, made of wood but light enough for children to carry." "The blocks represent nothing but simple rectangular shapes that children's imaginations turn into kitchens, space ships, cars, and other three-dimensional objects." Where does one get these? She said they are very expensive but can be bought at school stores. She does include instructions on how to make some for a much more cost friendly approach. I made my own big blocks by taking cardboard food containers (cereal, cracker, spagetti, ect boxes and stuffing them with newspaper and then covering them with white contact paper. They help up very well and the kids LOVED them. I also had the kids make their own hollow blocks. I had lowes cut 2x4 into 8 inch pieces, then we screwed them together forming hollow boxes. We even painted them with koolaide. The kids were so proud of their homemade blocks. One of my favorite items to put in my block center was pvc pipes. I had lowes cut them into 1 foot long pieces. They I bought every type of connector they had. They kids made giant structures with these. The best part was that it sometimes took alot of teamwork to build something. This is a great post!!!! I have tons of blocks and haven't really taken the time to organize them well for play. Now I feel like I have some direction. Thanks for the great information. I also have the PVC pipes that BranFlakes talks about and the kids LOVE them. It's about how the block center can foster dramatic play, very interesting and even some pretty funny parts for teachers. Love this post and these comments. I could not have stumbled across this article at a better time. Since I am working to build a new block center in my house.